505 is a massively deep-bodied daughter of OCC Great Plains 943G. You could roll a beach ball between her front legs as she is extremely wide-based, yet she is still feminine with a beautiful udder and very good feet. She has weaned 6 calves with a NR of 101 and has 4 calves with a YR of 106. Her dam posts a NR of 103 on 5 calves and a YR of 108 on 3 calves. We were fortunate that Yadons also let us purchase two of her daughters sired by 911. Another member of the BLACK BELLE cow family (recognize a pattern here?) 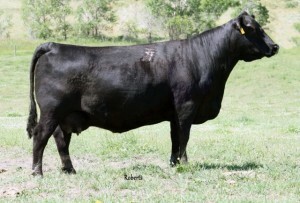 505’s maternal pedigree is full of maternal giants in the Angus breed. Her ET Calves by Sinclair Emulation XXP are due in 2015.